Believe this clock face is from the 1800's sitting in folks place for 40 years. Due to age they are to be sold as-is. Everything is AS IS. We do our best to describe each item in detail and provide pictures that feature any defects or issues that we are aware of. Complete as shown, tested for functions, missing shift lever. Includes Set of 2 Clock Winding Keys (1) Odd & (1) Even. (1) 5 Way Brass Clock Winding Key. Odd Numbers: 3-5-7-9-11. Assorted Pendulum Rods. I'm not a clock expert. I don't know any other information. and much more, but I don't know what. Everything you see is included. Latch, hinge screws, and face mounting screws included. Complete as shown, inspected, clean. Double and single ended. All in nice condition. The suspension hole will work with a thumb screw or taper pin. This is a stiff spring designed to keep the decorative Lyre Pendulums swinging in a straight line, will also work on wood stick type pendulums. The glass is intact. Overall in good condition. 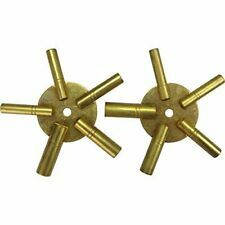 LOT OF 20 German made BRASS CLOCK MOVEMENT GEARS. No pivots on gears Smallest gears are approximately 3/4 inch (22.4mm) Largest gears are about 2 inches (55mm) PARTS for Repair or STEAMPUNK art. Condition is Used. Shipped with USPS Priority Mail. This is seen on the late 1880's and very early 1890's. Dial was lightly cleaned and sprayed with a clear Archival Removable Varnish to last another 100 years. This is from a ST world wall clock. Wind holes 3 7/8" apart and 1 3/4" below CENTER. 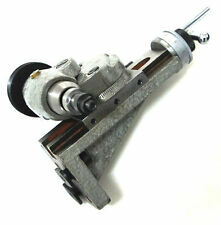 Grandfather Clock Winding Winder Key Crank for Ridgeway Howard Miller. New rc plexiglas type material, better than glass, light and unbreakable, approx 15X15". make Supersized seem small. Get images that. They are preowned in good condition. Two match and one don’t. Two are 10 3/4 “ over all and the other is 11 1/2” overall.All are. 154 in dia. New ListingAntique German Wag on the Wall Clock Floral Dial, Restoration Project. Here we have an antique German Wag on the Wall clock floral dial, selling as found , as a restoration project. It measures 12 1/2" high by 8 7/8" wide. See 8 pictures and ask questions to be satisfied with this item thanks. Winding Key, Howard Miller Original for Wall and Mantle Clocks. Winding Key, Howard Miller Original. (see pics) Sold at no reserve. Good luck. 50 feet of NEW brass cable with a kevlar center, correct in size and texture for a Herschede tubular bell grandfather clock. 50 feet is enough for 2 clocks. About 1/16" wide, or 1.65 mm. These are all different size and type knobs for winding and setting small clocks. These are a must have for any watchmaker and or clockmaker. 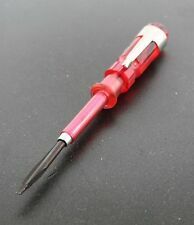 These are good quality and can really save a repair since many are missing. Estate Found Clock Parts Lot #3 Weights. (see pics) Sold at no reserve. Good luck. Great looking advertising piece an original from the estate of a clock collector. Complete Set of Bergeon Mainspring Winder no. 30076 for Alarm Clocks & Clocks. Minute hand is 3" in Length. (not included). Compact size 2 1/8”W x 2 1/8”H x 5/8”D. Made in USA. New pam clock bezel approx 14 7/8". Of bezel is 7 1'4". Asked about the length of Pend. The mvmt has good output power when pressure applied to cable wheel line. The largest is 5" Tall not including screw Mount. There are couple of Acorn and Vienna Regulator Clock Finials. The smallest are 1 7/8" Tall. I Want YOU to be Satisfied. Clock Repair Cutting Broaches. Clock Repair cutting broaches 12 piece. Great set of broaches for beginner or professional. Sizes from 15(.180”) to 70(.027”). .004 thick feather. 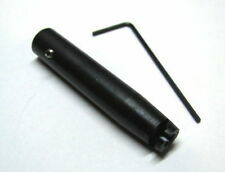 6" Suspension Spring Rod for Antique Clocks set of 15. Clock repair parts include movements, hands, pendulums, and other details. Clock-repair needs and parts available for watches, wall clocks, and free-standing time devices work to repair clocks and keep them running properly. Mix and match second hands with minute and hour hands, or browse complete sets for clock hands. How many parts does a clock have? Clock designs vary greatly, and the number of parts in the clock also vary. Where some clocks could have dozens of pieces, the simplest clock kits which only need to deal with time will have as few as four pieces to assemble. Professionals and more advanced hobbyists who wish to construct clock mechanisms from scratch for custom designs will need to purchase parts based on what functionalities they wish to include in the design. Are quartz clock movements easy to repair and replace? Many options are available for repairing clock movements, hands, pendulums, or any other clock parts. Repair kits often include tools and other additional supplies that you will need to handle the repair and replacement of clock parts. For more advanced work in clockmaking, Timesavers is an example of a brand that distributes the more heavy-duty and complex tools and base materials needed to build a wall clock or watch from scratch. Clock repair needs will also vary depending on whether there is a mechanical or quartz clock movement. Quartz clock movements may also have different types of hands, ranging from mechanized or pendulum-based time devices. Timesavers has quartz hands and clock repair needs as well as jewelry repair tools for watches. Timesavers alone also has dozens of styles for quartz hands. Timesavers also sells watch oil. What is the difference between high-torque and low-torque movement? Quartz clock movements come in a few different types. Low-torque hands and movements are parts for smaller timepieces. Some wall clocks will be small enough to use low-torque hands and parts, while others will need the high-torque clock movements. Quartz clock movements for watches will always be low-torque clock movements. Where low-torque clock movements only go up to about 10 inches, a high-torque movement will cover up to 30 inches. It’s important to remember that some clock movements will be mechanized rather than quartz. What this means is that the mechanical clock movement will not have the ticking second hand, but instead will move constantly in a smooth motion. 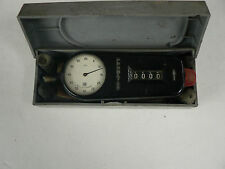 The quartz clock movement has the ticking-style second hand.